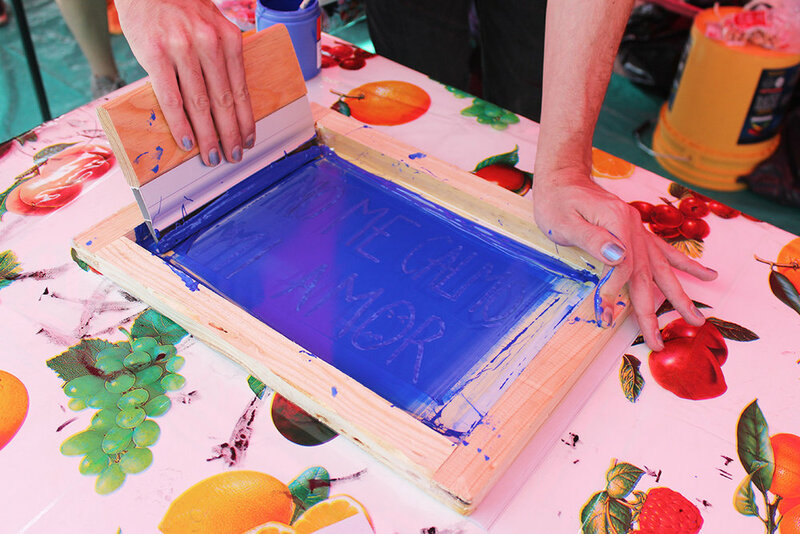 Tianguis queercuirkuir onsets from a screen printing workshop for collectives and organizations, proposed by Mariela Scafati, as part of her practice with the non-group, Serigrafistas queer. This workshop takes silkscreen from its place of technique and printing as an end, to then focus on everything that happens during the activity: the collaborations, the sharing, the completion of specific tasks, the ideas that generate new projects, and above all, the good times. People from different collectives and organizations participated in the workshop, enthusiastic about sharing this serigraphic work at the Monumento a la Revolucion plaza; in front of a transient audience and among summoned friendships. This proposal extends to the public space where silkscreen works as a platform to think in multiple ways through slogans, ideas, moods, poems, narratives, and memories, while printing on posters, t-shirts, editions, flags, and other supports. In the transition that occurs from the workshop to the tianguis; from serigrafistas to tianguistas; a series of meeting points take place: an exchange, a context that represents us. Both are active scenarios, places of participation and reciprocity, that generate the possibility of new temporary alliances. Tianguis queercuirkuir is this Friday February 8, a month from the international feminist strike. We celebrate having our own time and having us. Ruta del CASTOR presents Tianguis queercuirkuir, a public art project convened by Serigrafistas Queer & Mariela Scafati, at Monumento a la Revolución in Mexico City. Serigrafistas Queer and Mariela Scafati, in collaboration with fifteen different collectives and organizations from Mexico City, invite the public to a tianguis where screen printing works as a platform to think in multiple ways through posters, t-shirts, editions, flags, other supports, contexts and alliances. Place: Plaza del Monumento a la Revolución, Mexico City. This project is possible with the support of Tequila 1800. Special thanks: Gobierno de la Ciudad de México, SOMA, Galería Isla Flotante.